The « Coalition France pour l’Efficacité Energétique » is a French coalition of 9 members (environmental and consumer defense NGOs, industrialists and small business federations) committed to the promotion of energy efficiency. The increase of energy poverty and costs as well as the adoption of European directives related to energy efficiency force us to deeply change the way we consider energy in France. We need to switch from a supply side policy to one based on energy demand. The most compatible environmentally compatible energy is energy which doesn’t have to be produced in the first place. France’s final energy consumption has decreased by less than 1% a year over 2008-2014 and remained stable in 2015 in a context of lower energy prices, highlighting the need for a stronger regulatory framework for energy savings. The energy efficiency industry and local services companies can already answer the needs. They expect a clear legal framework and a stable market to invest massively. It will defend French consumers against rising energy consumption and prices by a reduction of their needs and a better control of their consumption and finally reduce energy poverty. 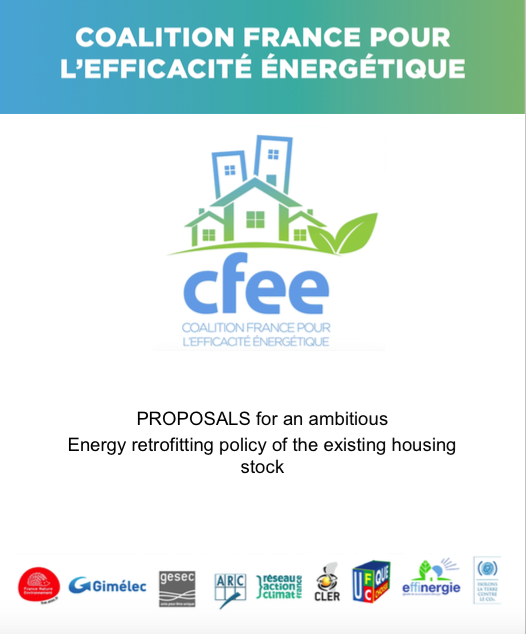 To improve energy efficiency in France, CFEE members brought forward 5 key energy policy proposals. If enacted in french energy policies, they would greatly contribute to the energy transition and the control of energy consumption in France. A more detailed presentation of the coalition and its proposals is available in the following document.